SPARTANBURG, S.C. – The Carlton SP8018 TRX is designed for high production in both clearing and large residential removal applications. A 99 Horsepower Turbo Charged Kubota diesel engine combined with Carlton’s two-stage cutter head drive provides significant cutting power. The Carlton Razor Cutting System offers a low profile holder design coupled with large faced carbide teeth. This provides a high cut-to-friction ratio resulting in highly efficient, large cuts with minimal chip scatter. 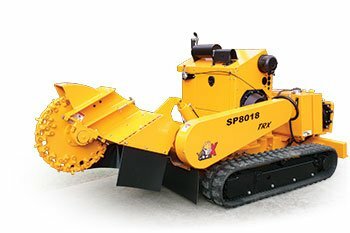 The SP8018TRX features large cutting dimensions: 43 inches above ground, 18 inches below ground, and 80 inches of sweep. The patented turntable design lowers the machine’s center of gravity, making it very stable while providing massive cutting dimensions and reducing flex and wear points. The unit’s Caterpillar track undercarriage provides a secure stance and extensive tractive effort, along with Caterpillar reliability. J.P. Carlton has been supplying professional arborists with quality tree care equipment since 1952. J.P. Carlton Stump Cutters Now Feature Kubota Engines! 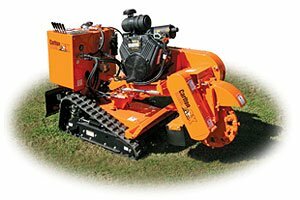 All J.P. Carlton Stump Cutter models now come with Kubota Engines. J.P. Carlton offers multiple stump cutter designs, including Walk-Behind, Self-Propelled, Tow-Behind, and Track-Mounted models. SPARTANBURG, S.C. – J.P. Carlton recently introduced a new model to their comprehensive stump cutter line, the SP5014 TRX. The new SP5014 TRX couples the industry’s best hydraulic controlled self-propelled grinder with the versatility of a rubber track undercarriage. 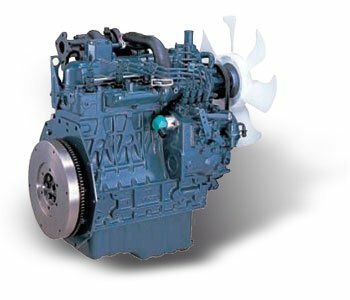 The SP5014 TRX offers numerous engine options including petrol and diesel from 30HP up to 44HP. These engine options include Kohler, Vanguard, and Kubota. The SP5014 TRX is also available with lever controls, wired remote control, or wireless remote control. The SP5014 TRX uses a rubber high track system that incorporates multiple idler rollers and spring tensioning to keep the track at optimal efficiency for running and tracking characteristics. This track system provides high floatation to minimize ground pressure and disturbance while providing a stable grinding platform and go anywhere traction. Copyright © 2002- J.P. Carlton Company. All rights reserved.